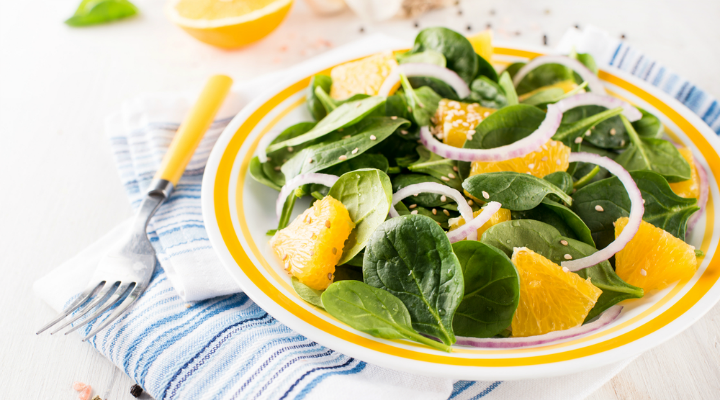 In a salad bowl, combine spinach and onion. Peel orange and cut into sections. Cut each section in half and add to the spinach mixture. Squeeze juice from remaining orange membranes into a measuring cup and pour in enough orange juice to make 1/4 cup (60 mL). Stir in garlic, salt, pepper and oil. Pour dressing over salad and toss to coat. Cover and refrigerate for 4 to 6 hours to let the flavors mellow.